Have you ever made a loaf of yeast bread or some yeast rolls? If not, take a little time to read through this article all about Bread 101 and try it. Bread making is actually quite easy, once you learn some basic techniques, and nothing smells as wonderful as baking bread. Bread machines are wonderful, but knowing how to make yeast bread recipes from scratch will help you better understand how your bread machine works. Plus nothing boosts your self-confidence more than pulling a fragrant loaf of bread out of the oven. Make sure your yeast is fresh. Active dry yeast, sold in individual packets, is the easiest type to use and keeps well in your pantry. There is always a 'best if used by' date on the packages, and you should follow this rigorously. If you are going to take the time to make bread, fresh yeast is essential. Cake yeast, if you can find it, really makes a wonderful loaf of bread. This form of yeast is fresh, stored in the refrigerator, and is very perishable. When you buy it, use it within 1 to 2 days, or it may mold. The temperature of the water, whether used to dissolve the yeast, or added to a yeast/flour mixture, is critical. Until you get some experience, use a thermometer. When the yeast is dissolved in the water or other liquid, the temperature must be 110 to 115 F. When the yeast is combined with flour and other dry ingredients, the liquid temperature can be higher; about 120 to 130 F.
The flour you choose for your bread also makes a difference in the quality of the final product. Bread flour makes a superior loaf. This flour is higher in protein content, and protein, or gluten, is what gives bread its unique texture. When water is added to flour, two proteins - glutenin, and gliadin - combine to form gluten. Gluten forms a network of proteins that stretch through the dough like a web, trapping air bubbles that form as the yeast ferments. This creates the characteristic air holes of perfect bread. All-purpose flour will also work just fine in most bread recipes. Don't use cake flour because there isn't enough protein in that type, and your bread will fall because the structure won't be able to withstand the pressure of the gasses the yeast creates. Whole grain flours and other types of flour add color, texture, and flavor to bread. These flour types don't have enough gluten to make a successful loaf on their own, so all-purpose or bread flour is almost always added to provide structure. The type of liquid you use will change the bread characteristics. 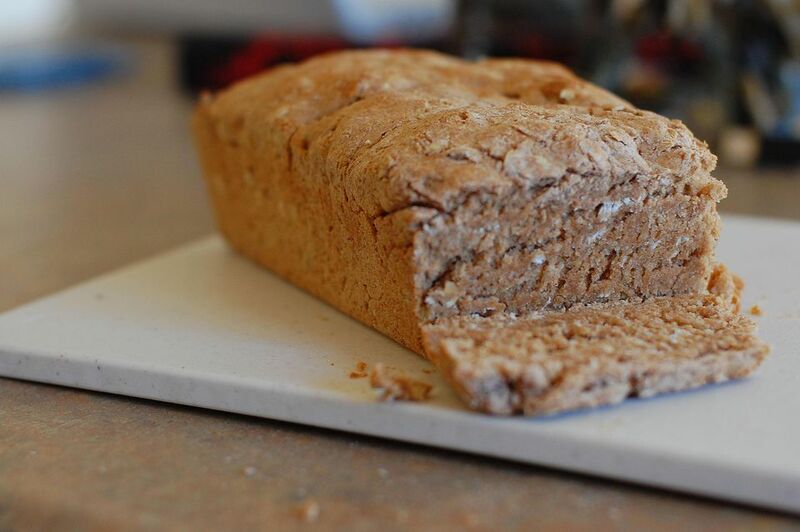 Water will make a loaf that has more wheat flavor and a crisper crust. Milk and cream-based breads are richer, with a finer texture. These breads brown more quickly because of the additional sugar and butterfat added to the dough. Orange juice is a nice addition to whole wheat breads because its sweetness helps counter the stronger flavor of the whole grain. Fats like oils, butter, and shortening add tenderness and flavor to bread. Breads made with these ingredients are also moister. Make sure you don't use whipped butter or margarine, or low-fat products since they contain water. The composition of the dough will be weakened, and your loaf will fail. Eggs add richness, color, and flavor to the dough and resulting bread. Egg breads have a wonderful flavor. Sugar is the fuel that feeds yeast so it ferments, producing carbon dioxide that makes the bread rise. Some bread recipes don't use sugar but depend on sugars in the flour to provide food for the yeast. Salt is essential to every bread recipe. It helps control yeast development and prevents the bread from over rising. This contributes to good texture. Salt also adds flavor to the bread. It is possible to make salt-free breads, but other ingredients like vinegar or yogurt are added to help control the yeast growth. Toppings can change the crust of the loaf. Egg glazes are used to attach other ingredients like nuts or seeds. An egg yolk glaze will create a shiny, golden crust. Egg white glazes make a shiny, crisp crust. For a chewy, crisp crust, spray the dough with water while it's baking. If you brush milk on the dough before baking, the crust will be softer and tender. Brushing the baked loaf with butter will also make the crust softer. Enjoy experimenting with toppings and the recipes! Begin your adventure in bread making by reading the recipe carefully. Make sure you have all the necessary ingredients. Start with a simple bread loaf recipe, like the French Bread recipe below. Measure the liquid called for, and heat it to the correct temperature. Sprinkle the yeast over the liquid, and let this sit for a few minutes. This is called proofing the yeast and ensures that the yeast is fresh and active. When the yeast mixture rises and starts bubbling, proceed with the rest of the bread recipe. Measure part of the flour into a bowl, and add any other dry ingredients or flavorings. Make a depression, or well, in the center of the flour, and add the dissolved yeast and other liquids along with eggs, if used in the recipe. Beat well to combine. Gradually add the rest of the flour until the bread dough becomes difficult to stir. At this point, flour your work surface and dump the dough out of the bowl onto the floured surface. Gather the dough into a rough ball, adding more flour as necessary so your fingers don't stick to the dough. Begin kneading the dough. To knead, turn the dough over several times, gathering any stray particles. Fold the dough in half towards you, and push away with the heels of your hands. Turn the dough one-quarter turn, and repeat this process until the dough is smooth, elastic, springy, and no longer sticky. Sprinkle more flour on the dough as you work so it doesn't stick to the board or your hands. This process will take from 5 to 10 minutes. Doughs made with bread flour typically require more kneading than those made with all-purpose flours. Grease a large mixing bowl lightly with shortening or butter. Place the smooth, kneaded dough into the bowl, turning it over so the top is greased as well. This step makes sure the dough doesn't dry out as it rises. Cover with a clean cloth and place in a warm spot. An electric oven with the light turned on, or a gas oven with the pilot light are perfect places for rising. Let the dough rise until double in bulk. This means the dough increases in size, and when you press your fingers into the top, the indentation remains when you remove your fingers. Punch down the dough by pushing your fist into the center. Pull the edges of the dough into the depression and push it down to expel the air. Then turn it onto a floured surface. Shape according to the recipe. Place the dough in greased loaf tins, or on a greased cookie sheet for free form loaves. Cover and let rise again until double in size. This second rising will take less time, because there is more yeast in the dough. Bake the bread in a preheated oven. The bread should rise a bit in the oven too - this is called 'oven spring'. Bake according to the recipe until golden brown. The bread is done when it sounds hollow when you tap it with your fingers. Remove from the pans and let cool on a wire rack, then stand back as your family attacks it. I like to brush some more butter on the top of the crust. This adds flavor and keeps the crust softer. Sometimes the yeast is stirred into the flour, instead of being proofed separately. The only change in this type of recipe is the water should be warmer. Follow instructions as above. Batter breads start with wet doughs or batters. This type of dough isn't kneaded, but stirred vigorously for a longer period of time to develop the gluten. The dough is stirred down after rising, instead of punching down, and spooned into loaf pans to rise and bake. Sweet breads and other savory flavored breads usually have special shaping instructions. Follow the recipes carefully.